In todays Chiropractic practice doctor are leaning more and more towards outsourcing the billing. We have years of experience providing Chiropractic billing services. Hiring a quality billing service is one of the most important decisions you'll ever make regarding the business aspect of your practice. It is crucial that your chiropractic billing company has the experience necessary to handle the complexities presented by Chiropractic billing and modifiers. Why not allow 5 Star to give you the financial peace of mind you deserve. Please visit our homepage to obtain additional information regarding our services, references and other pertinent details regarding our Chiropractic billing services. 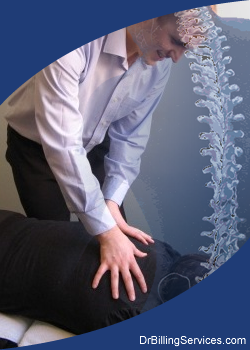 5 Star offers comprehensive Chiropractic billing services and collections. In order to avoid claims denials and receive maximum reimbursement, it is important for chiropractors to submit accurately coded claims. This can be easily accomplished by working with a chiropractic medical billing company, such as 5 Star Billing Services. At 5 Star, our billers and coders will work side by side with your practice to identify problem areas. We will determine the best course of action to correct those problems and will educate your staff on the most efficient chiropractic billing procedures. By allowing our certified billers to manage all of your chiropractic billing needs, you can ensure higher revenue and reimbursements. According to industry experts a claims adjustment rate of between 20% and 35% is considered good and acceptable. At 5 Star our account executives have an average of eight years in chiropractic billing. Their knowledge, ability, and dedicated follow-up is why at 5 Star our adjustment rate is consistently lower, as low as 12% with Medicare. At 5 Star we achieve A/R rates for our practices that are higher than the industry average. Simply put, you and your practice will get a higher average return per processed claim. Billing Services, we use advanced, web-based medical billing software that can easily connect to your organization’s own data. We can also work with your own billing or practice management software, as our billing specialists have worked with most major billing systems, including Medisoft, Practice Admin, Lytec, Eclipse, AdvantX, and others.